Interesting architecture with breezy views of the water. All rooms beautifully furnished in relaxed Keys style, including the 'Nautical Room', the 'Captain's Room', the 'Fish Room', and a private master suite with private bath, twin sinks, and French doors onto a deck with teak chairs. Interesting natural history mounts, area-related books and other reading material. Ceiling fans everywhere. Tile and hardwood floors downstairs. In-ground heated swimming pool with jets. Covered hammock overlooking beautiful tropical landscaping with bromeliads, coconuts and flowers; pelicans, herons, seagulls, hummingbirds, butterflies, tree frogs, and lizards galore. Even an occasional iquana. Lovely panoramic southern view over open water; easy access by boat to great fishing & scuba diving; ground floor lockable storage room for stowing scuba/fishing gear; bait freezer and fish cleaning station; screened porch for relaxing & dining, nice breezes; covered parking. Private deep draft boat dock; large deck for sunbathing & and swim platform on the Atlantic Ocean for swimming. My husband has been coming to the Keys since college and owning a home here was a dream for him. We spend most of our family vacations at Summerland Key. We have a great library of books from Hemingway, Keys history, gardening and wildlife as well as novels. Outdoor tiki shower, sleeping accommodations: 1 king, 2 queens, 2 twins, 1 queen futon (in loft), inflatable mattress; three color cable TVs, DVD, CD/cassette stereo, toaster, blender, coffee maker, fully-equipped kitchen with cookware, dishes and utensils, washer and dryer, all linens provided, private boat dock with mooring, DSL and wireless router for computer hookup. 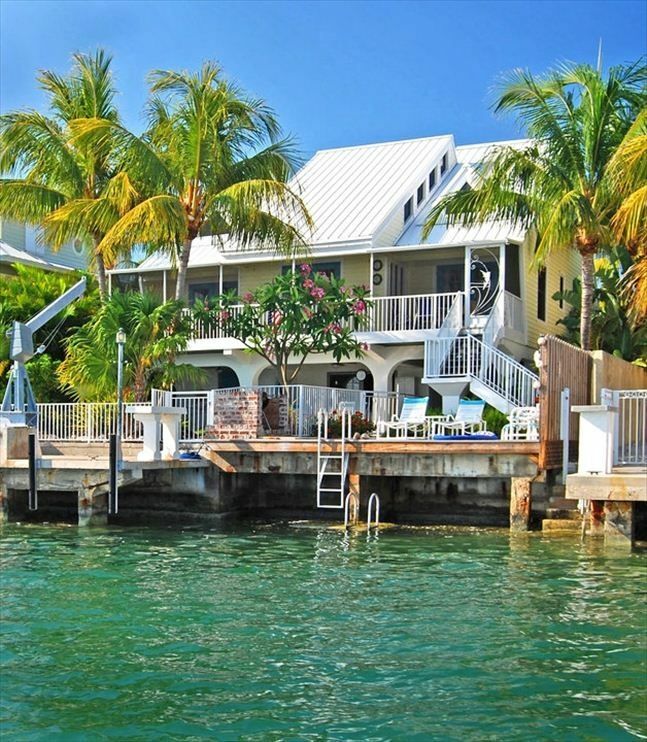 If you are looking for a Caribbean-like experience without the hassles and expense of going there, we highly recommend that you stay at Folsom’s Folly in Summerland Key, Florida. We, and our guests, did just that for the month of February, 2017, when we thoroughly enjoyed ourselves during every moment spent there. As you can see, the home and its accommodations are most comfortable, cheerful and inviting. We didn’t lack a thing, and shared some of the happiest and most tranquil days one can imagine. The setting of Folsom’s Folly is “to die for”. The tropical landscaping, open water views and gorgeous sunsets can’t be beat no matter where you go, and really match or exceed anything that private housing in the Caribbean has to offer. We loved the spacious outdoor patio and boat dock and, when home, spent most of our time relaxing in the more than ample lounges and chairs provided to guests. Our weather was perfect for the entire month which allowed us plenty of time to swim in the blue ocean water as well as in the well-maintained heated swimming pool which, to all’s delight, has hot tub-like seating with strong jets for a great body massage. For those of you who like to fish, we caught dozens of fish from the dock, some of which made it to our table for dinner. The fish cleaning station there was a welcome bonus which we used many times. Although the home has three full bathrooms, one in what we called the downstairs “Tackle Suite”, everyone especially enjoyed the outside Tiki shower - lots of space, a bench, & great water pressure at all times. Folsom’s Folly décor includes many whimsical and colorful wall hangings and collectibles which are, obviously, a means by which the owners, Karen and Sonny, have made their home so inviting, not only for themselves, but for all who have made, and will make it, their vacation home. So, don’t hesitate to book Folsom’s Folly for your next vacation. You’ll know that you’re in the great Florida Keys, but will think you’re in the Caribbean. Oh, by coincidence, it’s located on a street named “Caribbean East Drive”. My family and I have been coming to the Keys for over 15 years and I must say this home has been the absolute best we have ever stayed in. The location couldn't be any better with the Atlantic outside the back door and the Gulf minutes away. The home is spacious and up to date yet has that "Keys" feel. You are 25 minutes from Key West or Marathon so if you want a little busier pace it's close. We enjoyed the laid back, slower pace fishing off the dock, lazing by the pool and snorkeling in the bay. Wonderful owners, very attentive and genuinely eager to make sure our vacation was perfect. Definitely coming back!!! Our family thoroughly enjoyed our stay here this March. The entire party from adult to toddlers enjoyed the pool, view and entire place. Would definitely stay again. Between Islamorada and Key West so great lpcation. Thank you!! Absolute BEST! Outstanding comfort and very casual/tasteful setting. Outdoor shower is great. Screened porch with fans for just relaxing when not in pool which is partially shaded. All first class. Fishing was great. We caught tarpon from the dock. Took our boat out and caught dolphin, yellow tail snapper, redfish, king mackerel and all the barracuda we wanted for fun. Lobster were plentiful. Bought a standup paddle board while we were there and spent hours on it. Snorkeled with the kids. EASY access direct to the Atlantic which can be viewed from the porch. Kitchen is great and we cooked most meals as well as using the grill provided. FANTASTIC accommodations. So much to do we never watched TV although several sets are provided. We have stayed many nice places in the Keys and Bahamas...this is the best. Folsom's Folly is the nicest place we have stayed in the Keys. Thank you so much for allowing us into your home. We have a great time, your place is beautiful. I was with my family and my Mom she like the rest of us fell in love with your house. We took her out to Looe Key to snorkel she was in heaven. She is 80 years old and swam with a 350 pound Goliath Grouper. We went to take her parasailing but it was too windy the day we went to Key West. I have been going to the Keys for years and never stayed in such a nice place. From all of us we would like to thank you so much. I have sent a separate e mail with a picture of 4 of us at the Island Fish company. We had a great time. The house was perfect. The kids swam for hours on end, the weather was perfect (low 80s day, upper 70s at night), we loved having the French doors wide open with the breezes and the view, the landscaping is amazing (we felt like we were in a secluded private villa), your suggestions for restaurants were spot on (we love Pepe’s). We didn’t do everything I had planned but I think we were so happy just relaxing that we didn’t care. We did make it to Bahia Honda (much more beautiful than I remember from my college days! ), wandered around Key West (the kids were intrigued by the “local flavor) and generally just relaxed. Boating and kayaking, world-famous charter captain Jim Sharpe and 'Sea Boots' within walking distance, Key West and Marathon airports 25 miles away, great casual restaurants, fresh fish houses and marinas with boat rentals nearby, resort dining at Little Palm Island.